4 Autumn Trends, Which Do You Like? Tuxedo’s can look as equally marvellous on a woman than it is on a man. Angelina Jolie’s recent red carpet appearance was the perfect example of a Tux gone superbly right! A little bit of sultry and effortlessness is the key. Longer skirts are very appropriate for the cooler seasons and it definitely isn’t dowdy! Midi skirts are on the rise starting from now and in thicker, voluminous ways. Designer’s are currently loving the bias cut look. The leaves are falling in Autumn but in the fashion scene there’s no going away! 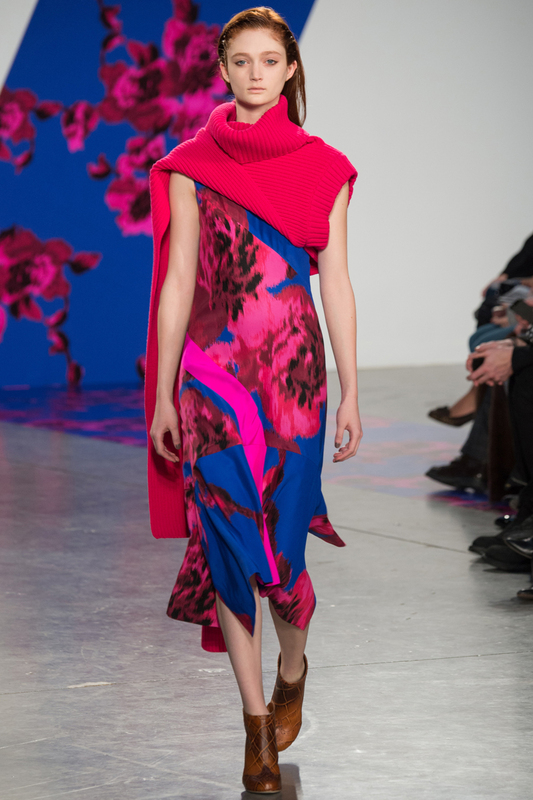 Thakoon showcased bright Autumn coloured floral prints on the runway in the boldest of styles. The deeper the colour, the better. Think magenta, mustards and cobalts. The soft autumn breeze calls for a flowy mesmerising coat. Waterfall styled coats and cardi’s give a very feminine touch to an outfit. We’re currently loving this soft-pink tie-waist coat from Blumarine.